Israel has unleashed another round of destruction and suffering on the Gaza Strip, even more ferocious than its 2008–9 invasion. Hundreds of thousands of Palestinians have yet again been displaced, over 1,817 have been killed and 7,553 injured (mostly civilians), thousands of buildings have been fully or partially destroyed (including numerous mosques, schools, and hospitals directly targeted). Neighborhoods in Shujai’yya and Khuza’a have been leveled and turned into piles of concrete and mangled iron. Witness accounts tell of whole families wiped out, collective assassinations, endless shooting at unarmed civilians, and around 430 children killed. There is no safe place in the Strip — not even UN schools turned into shelters that house well over 220,000 internally displaced Palestinians. After eight years of siege and blockade, forty-seven years of occupation, and sixty-six years of national dispossession, 1.8 million Gazans have been living in fear and terror for nearly a month now. The strongest army in the region is again bombarding its long-suffering population. The cost to Israel has been mainly military: sixty-four invading soldiers killed and more injured. There have also been three civilian deaths from thousands of homemade Qassam rockets and mortars fired into Israel, many intercepted by the American-funded Iron Dome missile system. Many residents of Israel’s southern towns (where state-provided shelters are prevalent) have left to unaffected or safer areas. Considering these facts, it is rather uncontroversial to conclude that for Israel the invasion of Gaza has essentially disrupted everyday life in the areas close to Gaza, but that for Palestinians in Gaza it has been experienced as devastation on an unprecedented scale. It will take years for Gaza to recover from the Israeli army’s material destruction, and even longer for Palestinians’ psychological scars, grief, and wounds to heal — if, that is, Israel allows them to live without bombs and invasions in the future. The fact that Israel can repeat Gaza 2008–9, destroy even more infrastructure, and kill even more Palestinians, is troubling for all those who believed that the public outcry and outrage of the past would at least put some constraints on Israeli state conduct. Why is it, then, that we find ourselves again faced with such a grim actuality? Why is it that Israel is given a free hand to deal so violently with the Palestinians? What could put constraints on Israel’s behavior in the future? The crux of the matter lies in the fact that Palestinians are strategically and geopolitically insignificant, both in the region and as a dominated-without-being-exploited people. For Israel, since Oslo and its closure policies, Palestinians have been cut out of the Israeli labor market. Israel no longer exploits them directly as laborers. That leaves them not only without leverage to affect Israeli policy but also completely dispensable as a population. They need Israel for everything (food, resources, water, electricity, access to their increasingly curtailed lands and to other areas inside the West Bank, access to the outside world, etc. ), and Israel needs them for nothing. Israel holds the Gaza Strip and the West Bank as a captive market and dumps its own goods there without Palestinians having any leverage whatsoever to determine their own economic and political development. Oslo’s occupation mechanism has thus not only disenfranchised Palestinians politically (by blocking independence) but economically as well, leaving them completely dependent on and controlled by Israel. They are, as a result, a superfluous population. Oppressed but not exploited, dominated but not needed. What this means is that whenever Israel chooses to invade, attack, and kill its captive Palestinians, it is free to do so. This freedom has led to horrifying developments in Israeli society (read any recent account by Gideon Levy in Haaretz ). Only unrestrained, state-sponsored racism can explain the shocking statistic that 95 percent of Israeli Jews support the Gaza campaign. Hatred for Palestinians is blatant in every Israeli newsroom, for example, filled with ex-military and security officials fantasizing about decisive blows to Hamas. Rabbis, settlers, and politicians add to the general atmosphere of Arab baiting. Doesn’t Oz deserve a Nobel Prize for Literature for this brilliant use of his imaginative powers? Like Morris, he too advocates the demilitarization of Gaza by force: “In my view the ultimate evil in the world is aggression, and the only way to repel aggression is unfortunately by force. That is where the difference lies between a European pacifist and an Israeli peacenik like myself.” Does he really believe he is promoting peace when his own language reeks of hatred? With Israeli peaceniks like Oz, who needs warniks? Israeli Prime Minister Benjamin Netanyahu will be cheered along by Oz’s effortless adoption of his new wildly aggressive demand. Under these circumstances of widespread colonial racism and war against the Palestinians, constraining Israel is the only option. Three spheres of pressure can be outlined: internal, regional, and global. Applied in conjunction, these constraints would be far less vulnerable to being either neutralized or countered by Israel and its allies. First: internal. Israel fears losing control over the population of the occupied territories through mass demonstrations and confrontations: i.e. through organized popular contestation of the Oslo occupation regime. Here the Palestinian Authority (PA) plays its crucial role in policing the occupied, keeping them away from the IDF, and coordinating security matters with Israel: handing over suspects, allowing Israel to freely conduct assassinations, kidnappings, and imprisonment of militants, and sharing security intelligence. As long as local security collaboration continues, Israel will have a serious advantage over local resisters and political organizers. This is the key area of contention between Palestinian resistance groups (including Hamas and Islamic Jihad) and the Fatah elite and PA. The second constraint is regional: popular and democratic Arab movements can only mean a better environment for Palestinian struggle and Arab solidarity. This week, for example, saw tens of demonstrations across Jordan calling for the permanent closure of the Israeli embassy, the end to the Israeli-Jordanian peace treaty, and the end to economic cooperation. As Gaza 2014 shows, a stateless people like the Palestinians are exceptionally sensitive to regional changes. The ouster of Morsi by the Egyptian army, the clampdown on the Islamic Movement in Egypt, and the re-empowerment of the ancien régime has not only left Hamas without a key regional ally. The demobilization of the revolution and its repression and disorganization by Egyptian army and elite have also left Palestinians without the popular Egyptian support they need in order to improve their capacity to withstand and resist Israel’s occupation. The Egyptian regime has, as a result, had a free hand to choke Gaza as much as it wants, both economically and geographically, and to help block its access to the outside world. If Israel is mainly to blame for its closure (since 1991) and siege (since 2007) policies — preventing Palestinians from traveling to the West Bank and Israel — Egypt has been a key partner in the implementation of the blockade on the Gaza Strip. Rather than alleviating it (as during Morsi’s brief reign), Egypt has mostly intensified it, seriously contributing to Gazans’ sense of insecurity, confinement, and spatial suffocation. The biggest supporter of Israel in the region remains Saudi Arabia. Locked into an alliance with the United States, Saudi Arabia sees Israel as an asset in its regional struggle not only against Arab nationalism (of the radical Nasser variety, as in 1967), but also against current Iranian and Shiite empowerment in the region. Ex-head of Saudi Arabian Intelligence Turki al-Faisal’s support for Israel was blatant when he blamed Hamas for the current Israeli invasion of Gaza. Even King Abdullah’s belated statement barely mentioning Gaza had far too many warnings and attacks against “terrorists” that Islamic Jihad felt it was directed against the Palestinian resistance itself. If a popular regime change in Saudi Arabia seems unlikely today, a weakening of any link in the Saudi-Israeli-Egyptian-Jordanian-American chain is not out of the question, especially as the Arab revolutionary spirit re-organizes and coalesces again. Many states in the region are complicit in Israel’s occupation. By buying $11 billion in arms from the US and hosting the biggest US military camp in the region, Qatar contributes to US power in the Middle East, even as it gives diplomatic and political support and refuge to Hamas. Supporting the end of the siege while empowering Israel’s main backer in the region (not to mention suppressing democracy and human rights in its own backyard, while funneling monies to fundamentalists in Egypt and Syria) only conveys the peculiarities of the Qatari monarchy, not its commitment to Arab freedom. If Qatar is not as big a problem as Saudi Arabia, it still is a problem, and plays an active part in the anti-democratic Gulf regional bloc (the GCC). What of the global constraint? World public opinion matters, and the more the public in the West understands the reality of the Israeli occupation and Israel’s current fascist turn the better. Civil society pressure can be effective if not in stopping wars then in imposing costs on the Israeli occupation: boycotting occupation-linked goods and services, calling for arms sanctions against Israel, and prosecuting Israeli war crimes. 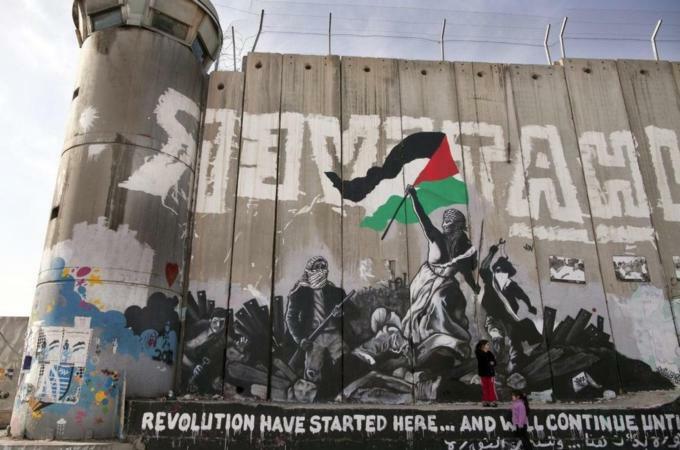 Solidarity with the Palestinians has grown tremendously in the last decade in many different spheres, and it is only getting more organized and coherent in its methods and demands. BDS is the best way for people in the West to tell Israel that colonialism is unacceptable. Many things need to happen in order for Gaza 2014 to be Israel’s last war on the Palestinians. Israel and its allies cannot hold back the struggle for democracy, human rights, and self-determination for much longer. Justice won’t be to Israel’s liking, and let’s hope it comes soon. Thanks to Gilbert Achcar and Stephen R. Shalom for their helpful comments and suggestions.